Sand, Wind and Stars - LRDG, 70 years on: Mine's a pint. 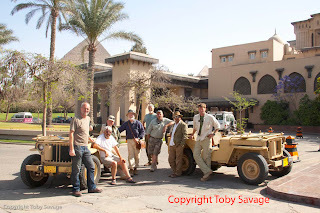 Safely back at The Mena House Hotel, Cairo and ready to celebrate! As the sun sets on the Pyramids our merry band of desperadoes were ready to sink a few beers and reflect on exactly what we have achieved. The first big drive through vast tracts of the Sahara in authentic Jeeps since World War 2. Nearly 3000 miles in total of which roughly 1300 were pure desert. Actual breakdowns were minimal and fortunately all things that could easily be fixed. We viewed 10 LRDG sites and artefacts and discovered an important new one (more info in a future post). We all got on well and found that 7 normally sensible men can easily revert to giggling school boys when separated from their normal habitats. The comments left both here and on Facebook by so many people have given us a lot of pleasure and raised a few laughs. Thank you. Ahead lies the complex logistics and beauracracy of getting both Jeeps back up to Alexandria and into a container for their return journey. And all this started in August 2007 when you bought the first Jeep! What a fantastic journey it has been - even for those only able to vicariously experience it through your blogs. So how are you going to follow it up then? Excellent, well done, that's some achievement (ten days without beer I mean), talking of which your wine's ready for picking up!